Choosing the right storage products is essential to ensuring your possessions are kept neatly and safely. This is where the quality of the products you choose really matters. The last thing you want is to risk damage to your car or your family from tools or storage containers that might fall off improperly secured hooks or unstable shelving. The first thing to look at when choosing garage storage is a way to hang things on the wall. As I’ve mentioned before, the secret to an organized garage is having a place to hang everything and get it off the floor. But not all wall storage is created equal. There are degrees of quality and unfortunately you just aren’t going to find top quality at a big-box do-it-yourself store. It’s difficult to tell the difference on visual inspection, but the slatwall that’s sold in retail stores is not built to the same standards as slatwall used by professional garage firms such as Nuvo Garage. Our slatwall is made of heavy-duty PVC, which holds a large amount of weight and stands up to moisture. The typical big-box slatwall is made of MDF, which is a wood fibre product. You can install it and hang your things on it and it will look good and work well for a while, but it won’t hold the weight and can’t withstand the moisture over time so it will eventually start to break down. Our slatwall comes in 1 ft x 8 ft panels. This makes it much easier to handle as well as more customizable to fit your space. Sometimes you just need a small section of slatwall to store a few tools or to fit into a recess in the garage wall. It also comes in a variety of colours to match with shelving and floors. It also comes with matching trim to create a finished look and protect the exposed ends from nicks. The screws are even colour-coded to make for a more seamless look. 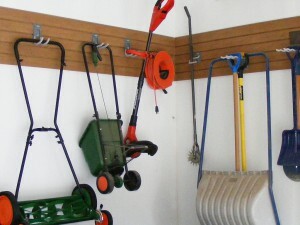 Once the slatwall is installed you can think about what accessories you need to organize your items. The beauty of slatwall is you can add or change the amount of storage you have over time by adding more panels and adding or changing the shelving and hook options. You can hang anything with a hole in the handle. That means gardening tools, sports equipment, recycling bins and even something as heavy as a lawn mower. Nuvo Garage uses the unique Camlok system. The hooks lock firmly into the slatwall and you don’t have to worry about them falling off. They’re also removable because they don’t screw into the slatwall like the big-box store hooks. This is handy when you’re rearranging your wall hooks to accommodate winter or summer tools and toys. You can easily remove the hook and place it somewhere else. Our shelves use Camlok too, as well as our baskets. Baskets are a great way to store things such as balls, sports equipment, car accessories and even antifreeze and heavy bags of salt. If you’re planning to stay put in your home for a while and you want a garage renovation that will stand the test of time, consider investing in a quality product. I guarantee it will save you time and money in the future.